These days, when children come in for their doctor’s appointment at Vista Community Clinic (VCC), they encounter monkey arms reaching out from a tree; Martians staring down from the ceiling in the exam room; 3-D bugs and butterflies; and books on shelves, books under seats and books on trees. For pediatric patients and families at Vista Community Clinic (VCC), a visit to the doctor is now an opportunity to read, explore and learn. A recent remodeling project has transformed the entire pediatric unit at VCC’s flagship clinic on Vale Terrace Drive in Vista into an attractive, educational and interactive space for young patients and their families. The remodeling project was made possible by a generous gift from the late Muriel and Hans Schiff who were long-time supporters of VCC. The waiting area brings the outdoors inside with a large sculpted life-like tree with books hanging on branches. A wall, with sculpted bushes and games for children, divides the well and sick areas. Lime green cushioned box seating replaces hard backed chairs. Exam rooms have a sculpted element and a mural with themes such as cars, trains, magic, garden, space, animals and hidden treasures. The design and installation of the VCC pediatric remodeling project was done by Working Designs and Installations, a New Jersey-based design company. The overarching goal of the remodeling project was to use the time spent in the doctor’s office to spark and nurture children’s interest in reading. Books beckon young readers from tree tops, from under seats and in book shelves carved into bushes. 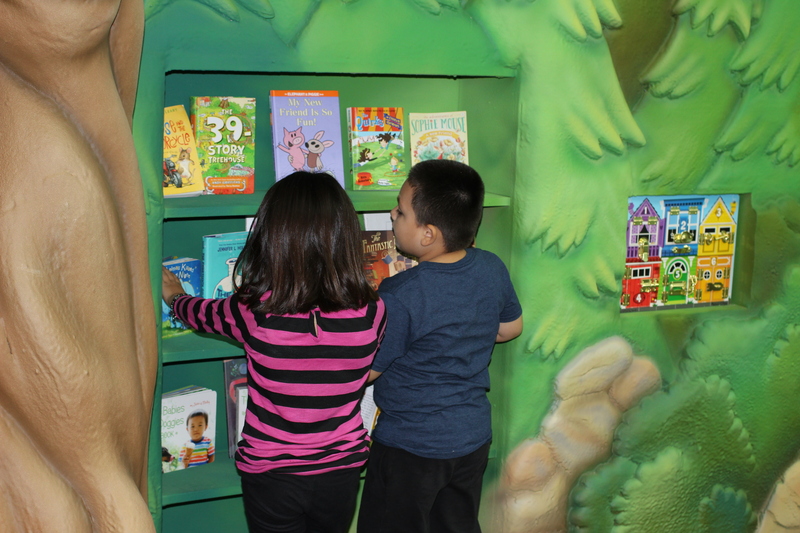 For many years, health care providers at VCC have used pediatric well visits as an opportunity to educate parents on how to encourage a love of reading in their children. VCC participates in the nationwide Reach Out and Read program where providers give tips to parents on how to engage their children with books. Young patients who come in for well visits also receive a book to take home and read with their families.